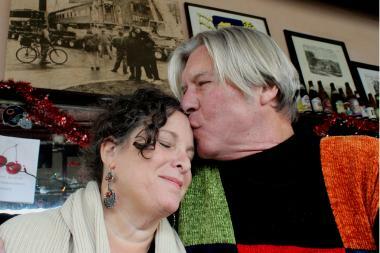 With a photo of the day they brought a rail car to River West on the wall behind them, David and Jackie Gervercer, owners of The Matchbox and The Silver Palm, plan to leave behind the tiny River West taverns to open a bed and breakfast in Mexico. Their love sparked at The Matchbox. David Gervercer owns the tiny River West tavern where for the longest time he also mixed the cocktails and flirted with abandon. Jackie Fields, a tiny gal with a smart mouth who dressed like a ‘40s movie starlet, couldn’t keep her eyes off him from the moment she showed up at the bar. More than once she wrote her phone number on a cocktail napkin and slid it his way across the bar. And every time — except the last time — the object of her affection, all blond hair and ice-blue eyes, tossed her pickup note in the trash. Like most barroom love stories there’s no way to be sure how much of their tale is true. Even now, 16 years after they met and nine years after they got married, The Matchbox’s First Couple doesn’t agree on all the details. David says that a key to his future wife’s apartment was tucked inside that last napkin she pushed across the bar. Either way, they’ve been together ever since something like that happened. And they’ve spent nearly all that time nurturing a special part of Chicago tavern history at the corner of Milwaukee and Ogden — my favorite bar. Together, they got themselves a train car, parked it on salvaged tracks in a vacant lot next door to the Matchbox and built a restaurant around it — The Silver Palm, home of “America’s Best Sandwich” and the place they got married. On Friday, David and Jackie will work their last shifts. 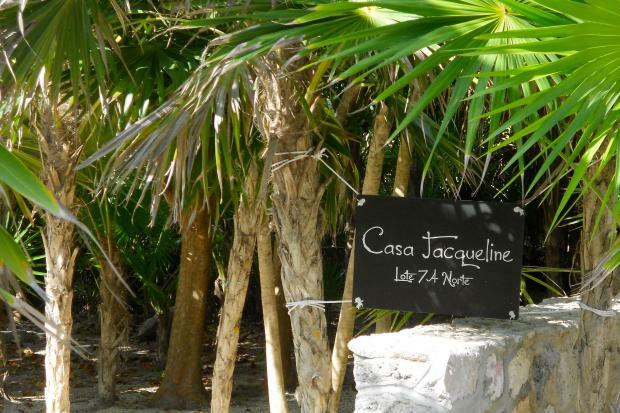 And about a week later they’ll head to Tankah Bay, Mexico, a scenic spot on the Yucatan Peninsula where they’ve built themselves a quaint bed and breakfast with a view of the sea — Casa Jacqueline. Still, his stomach is in knots. The Matchbox — the place he scored a last chance at love — isn’t an easy joint to leave behind. David once taught English at Austin High, but gave it up to work in the restaurant business and eventually manage Chicago’s most exclusive yacht clubs. He made good money, enough to invest in restaurants and real estate. In 1994, David and his pal Richard Fay spotted a For Sale sign on a tiny brick tavern wrapped in a chain link fence topped with razor wire. After some wrangling, he bought The Matchbox from Israel Segal, a Jewish man who spoke Yiddish and owned the place for more than 60 years. Segal intended to name the bar “The Matchbook” — a reference to the tiny tavern’s slim triangular interior — but his idea got lost in translation. So, The Matchbox stuck, or so the story goes. Segal would open the place early to sell half-pints of liquor to businessmen headed downtown — some of them Cook County judges. And the shot-and-a-beer joint shut down in the evening just after suppertime. Segal died before David got a chance to show him the reincarnation of The Matchbox as a cozy place for classic cocktails and conversation. For a while there, though, the place was wild. Always packed with people standing belly to back resting drinks on the windowsill and struggling to squeeze to get to the bathrooms at the narrow end of the bar. Long before Coyote Ugly was cool, Matchbox drinkers danced on the bar in various states of undress. And from time to time other crazy things happened —“stuff that was illegal that I can’t tell you about,” Jackie says. It wasn’t until David hurt his back that Jackie, who waitressed at Kiki’s Bistro and a few other places, filled in behind the bar. Even when David’s back was healed, he wouldn’t let her quit The Matchbox. Now, regulars know her for pouring very pretty drinks, including an Old Fashioned garnished with cherries soaked in French brandy, and serving them up with irony-soaked sarcasm. In December 2001, the idea for The Silver Palm expansion was born in an alley over a smoke. David and a couple bartenders were tipsy when the question of what to do with the vacant lot next door to The Matchbox came up. The next day David saw a picture of a silver dining car, originally named "The Washington," listed for sale on the Internet. “I flew to L.A. and said, 'OK, I’ll buy it,' ” David says. It took 16 months and more money than David likes to admit to get the city permit he needed to set that train on tracks. He renamed the rail car after a short-lived Atlantic Coast Line Railroad train that ran from Chicago to South Florida in the '40s. High above the top-shelf booze at The Matchbox is a black and white photo of David cuddling with Jackie in front what would become "The Silver Palm" — the place where David made an honest woman of Jackie and a renowned food writer’s endorsement saved them from financial ruin. And he must have meant it, David says, because producers made them shoot the scene three times. When Bourdain "said it, I lost it,” David said, recalling how his excitement ruined the first two takes. “Now, admittedly, I had too much to drink. But by the third time Bourdain said it I knew he wasn’t kidding." On Feb. 3, 2009, the day after that No Reservations episode first aired, The Silver Palm sold out of Three Little Pigs in 30 minutes. If David ever gets the chance, though, it probably won’t be at The Matchbox. A new great adventure awaits them in Mexico. What calms them is knowing that they’ve got the perfect person to keep alive the tradition of intimate drinking at The Matchbox: longtime bartender Colleen Bush, who will run the place. They’ll be back from time to time. “We’ve already got two trips booked,” David says. But if you want Jackie to pour you an Old Fashioned after Friday, your best bet might be to book a stay at Casa Jacqueline by the sea. Like The Matchbox it’s a tiny place, just two guest rooms, where friends are always welcome.